I’ve finally made up my mind! SO, we decided yesterday to move the party to my sisters house. Her’s is a little bigger… not horribly far from where we live, and we thought it’d be easier. But then all night I was so sad about it. I guess I just didn’t realize how much I really had my heart set on having it at our house. We fought REALLY REALLY hard to get her HOME… and home is where I want to celebrate her first year of life! So we’ve changed back to our original plan of having it at our house! Same time… sorry for my craziness! THANKS again to everyone for supporting us and praying for us this past year!!!!!! YOU all are amazing!!!! 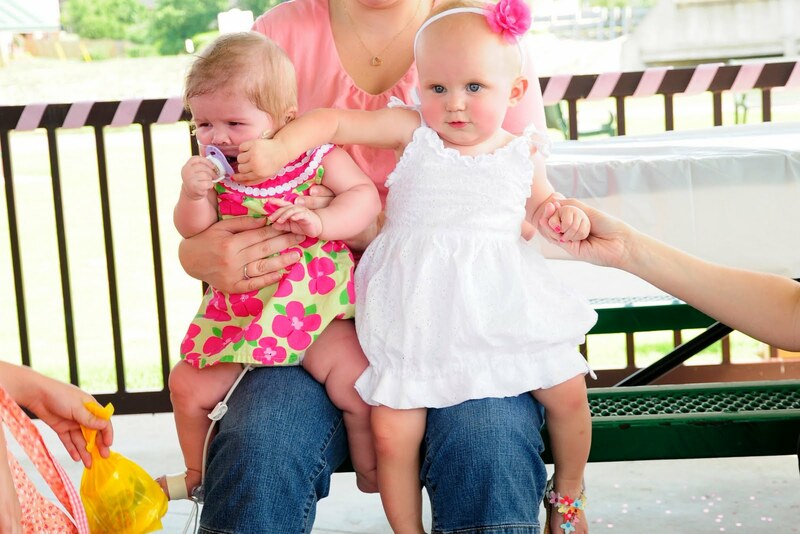 Annabelle (and the rest of us) went to her cousin Lyla’s birthday party yesterday! She turned one on Saturday… just one and a half weeks before Annabelle will! As you can tell, Annabelle was not pleased about the matter. She knows her Mommy has told her NEVER to share binkies because of germs. I’m sorry, but I pretty much cry laughing every time I look at this. It is just so TOTALLY their personalities! LOL at those girls! I can understand you wanting it at your house, totally..Hope all goes as chaotically perfect as a first birthday party can go! I hope the party is a ton of fun for everyone, especially the birthday girl. I'm glad you moved it back to your place. Aw, what sweet girls! So glad your daughteer is able to have an enjoyable (though hot) first birthday party! I've been praying for her…hope all is going well. I'll stop by for a bit, but I goofed and ordered our Harry Potter tickets for during the time of her party. So excited that we get to celebrate Annabelle turning 1 and praising God!!!! !